As we speak, I find myself on a bit of a science fiction kick. On the back of Way Down Dark by James Smythe and Crashing Heaven by Al Robertson, I'm deep in Seveneves by Neal Stephenson, with Slow Bullets by Alasdair Reynolds, Nemesis Games by James S. A. Corey and Aurora by Kim Stanley Robinson coming up. Far be it from me to moan! The first few of those books have been brilliant, and I have every reason to expect great things from the remainder. If I had my druthers, I'd be reading a bit of fantasy, a spot of horror and maybe a mite of crime between all that sf, but deadlines are deadlines, and that's fine. Building worlds is hard work: a self-evident statement which goes some way toward explaining why most authors make do with the mundane plane that has us all in its thrall. But putting the umpteen pieces of truly wonderful worlds together—worlds whose histories and mysteries resonate with readers and ring of authenticity despite the fact that they’ve been conjured whole-cloth—has to be harder by far. There’s no right way to do the deed, either, and the field is replete with wrong ‘uns. Some creators descend into tedious detail; others leave so much to the imagination that the foundation of the fiction that follows is fitful. Robert Jackson Bennett falls fleetingly afoul of the former problem in his first full-on fantasy; but I’ve got good news, too, in that the world, when it is built, is brilliant: the story of City of Stairs springs from Bennett’s setting, leading to a feeling of coherency, of completeness, that precious few fantasies can match. The narrative’s characters, too, are inextricably of the divided domain it describes. Imagine, if you will, a realm in which gods once walked among men: a Continent complete with a half-dozen different living divinities. No one can say with any certainty where they came from, or what they could possibly have wanted—only that each of the six built its own city, its own base of operations, and called upon its most fervent followers to further the divergent doctrines of their chosen one of choice. 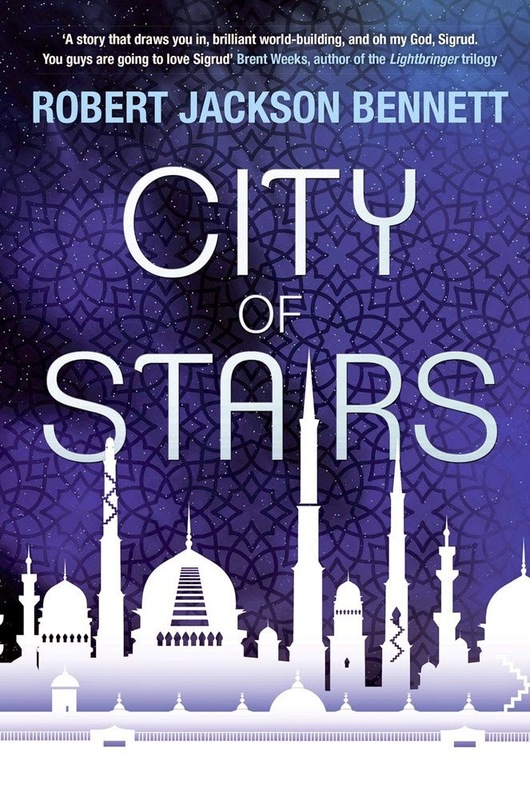 Read the rest of my review of City of Stairs on Strange Horizons. You can and you should, too. It's a bloody good book—certainly the most satisfying fantasy I've laid eyes on since Smiler's Fair. Hmm, if you're calling it the most satisfying fantasy you've laid eyes on since Smiler's Fair, then I think I need to read Smiler's Fair. Somehow that one just slipped by me, but I loved this - especially once it found its stride in the second half. City of Stairs is more than fiction and more than a higher octave of fantasy. Subliminal comments on colonialism, terrorism, and the choices made by civilizations urge readers to reconsider their beliefs. Perhaps the most important question posed by the novel is whether or not we create our own monsters. This question may very well urge readers to revisit our shared histories and reconsider our shared futures.